June 22, 2011, Oia, Santorini, Greece: I knew I'd find Justine there. From the moment I entered that little bookshop in Ia, I knew I'd find books in the style of my well-read brother. Still, Atlantis Bookshop itself was something I didn't expect to stumble upon in a tourist haven on a Greek Island. Inside, I instead tasted flavors of San Francisco's City Lights Books and Stinson Beach Books, "located directly on the San Andreas fault halfway between Dogtown and Jimmy's Gulch", according to my worn bookmark. 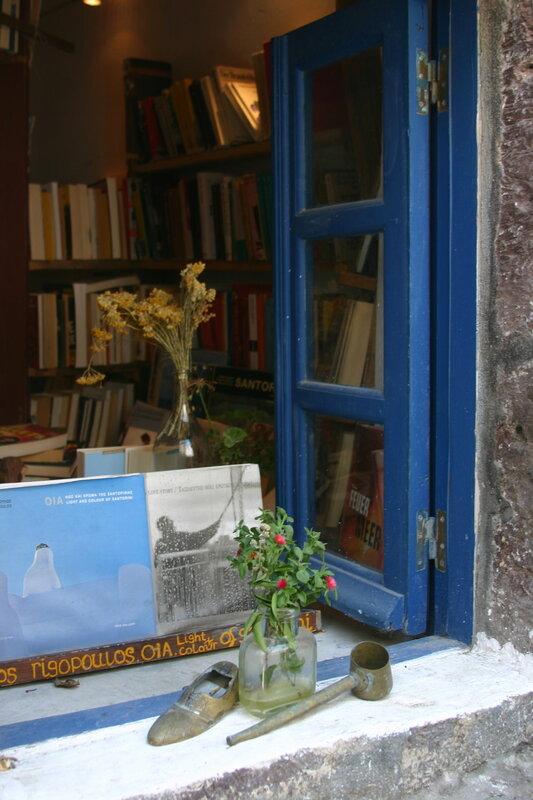 I didn't expect to find one of the world's best bookshops in a town packed with cruise ship tourists on the island of Santorini. But what a find! 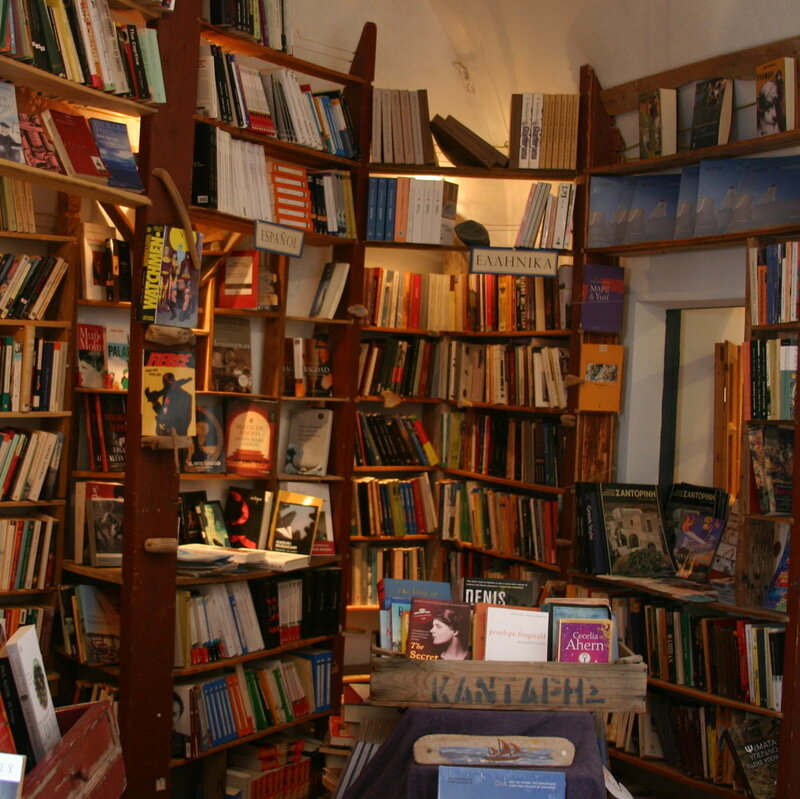 Rustic wooden shelves teetered with books piled up to the ceiling of the tiny cave. Books at all angles, in all sorts of piles, penned in all languages, outlined the asymmetrical room, tottering on the brink of madness. In the back room, a bed was crammed into the corner of the shop amid nooks and crannies and precarious shelves above. The shop's tiny rooftop terrace could be accessed out its door, up its teeny steps onto to the pedestrian walkway above. "I love your shop," I told the woman clicking away. "My brother would really love your shop." "Stay awhile," she said, stamping my book with the stamp of a wave from Atlantis. She tucked in a bookmark for good measure. I knew I'd find Justine there. I couldn't find Laurence Durrell's novel on my Kindle, but there it was, stashed away in Ia's Atlantis Bookshop, right where it belonged. I couldn't wait to get started on the novel my hyperbolic brother had recommended for this trip as "possibly the best work of fiction ever written." Finding Justine in Atlantis seemed just right. As did finding a really good bookshop. Every town worth living in needs one of this caliber.